Employee Appreciation Day is March 1 – the one day of the year we are especially reminded to appreciate those who make our organizations thrive. Keep these four easy-to-remember tips in mind, and make this the best Employee Appreciation Day yet. Most of us would agree that it’s a bad idea to wait until the last minute to purchase your children Christmas gifts or your spouse a birthday or anniversary gift. Why should it be any different with Employee Appreciation Day? Your team will be able to tell if you just made a last-minute run to the doughnut shop before arriving to work late, or if you really spent some sincere time and effort into planning the day’s events. The best time to begin planning is today. 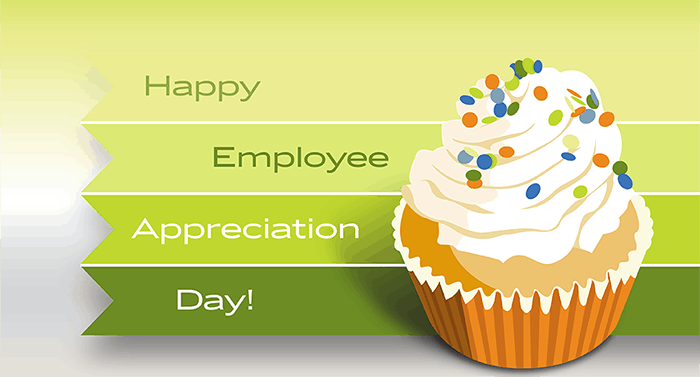 When it comes to recognizing your employees on Employee Appreciation Day, it’s a good idea to have a focused event planned, or to have tangible employee appreciation day gifts or notes for each one of your employees. In other words, each employee should know that there’s something special about this day. Just having a box of bagels for grabs in the break room doesn’t cut it. Each and every one of your employees should go home with something, be it a gift, a thank you note, or a really great memory of the day. Above all, make the day fun. Appreciation is about spreading joy. Remember why you are appreciating your employees. Your words or notes of appreciation should include how your employees create value for your company and its mission. You probably inwardly appreciate your employees in a million little ways. Now is the time to let those words of gratitude flow out to their intended recipients. When your team members understand in a concrete way how their virtues of hard work, patience, diligence, conscientiousness, tenacity – (you fill in the blank) – add value to your business, they will be encouraged to build those virtues. Both they and your organization will benefit from that. If you’ve been thinking about starting a new employee recognition program in your organization, there’s no better time than Employee Appreciation Day. With Terryberry’s Give a WOW Quickstart, organizations can have a peer-to-peer recognition program up and running in just a few minutes using a self-service start-up wizard. Give it a spin using the Free Trial available online. Terryberry’s support team is also available to help customize or enhance your program at 800.253.0882. After the sun sets on Employee Appreciation Day, remember that appreciation doesn’t go into hibernation for the rest of the year. Make appreciation an ongoing part of your company’s culture. You can do this numerous ways, and we at Terryberry are always here to help. Contact Terryberry to learn about creative ways to make employee appreciation a part of your workplace culture day-to-day.